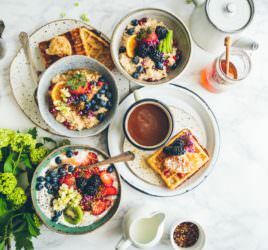 The role of nutrition in depression is one area that has been under-reported or indeed under-recognised when it comes to mental health, despite awareness of mental health issues increasing. The body of evidence and indeed the medical literature shows a clear link between the diet and mental health and specifically the role of nutrition in depression. Fundamental to my approach with any client is uncovering the root cause of any symptoms and this applies to the reporting of anxiety and depression in exactly the same way. Unfortunately this is often overlooked in many of the discussions in the public eye, whether on the TV or online, despite the evidence. Depression is estimated to affect 350million people worldwide, with its symptoms associated with decreased productivity as well as decreased quality of life and wellbeing. Traditionally, it is not uncommon for the treatment of depression to focus on the biological and psychological pathways and for anti-depressants to be prescribed, with ease, from the outset without any attempt to delve deeper and find out why there is depression in the first place. Yet, there is significant evidence to suggest that the role of nutrition in depression, in other words diet quality as well as lifestyle factors, contribute to a number of mental illnesses and such measures can be used in the management of mental health issues. I believe Depression should be considered as the symptom of an imbalance in the body and as such, it is important to get to the root cause of this imbalance and address this imbalance, rather than masking its symptoms. Food plays a key role and it is vital to look at the diet and consider whether there are any deficiencies that may be contributing to development of mood imbalances as well as considering the management of mental health issues or prevention in the first place. The interactions between different nutrients are equally important with a varied diet will provide the essential nutrients. The brain works hard 24/7 and needs to be constantly fuelled from the foods we eat. Without this fuel, brain function will be affected and ultimately, so will your mood. According to the Mental Health Foundation, those who reported a mental health problem of any degree also reported a less healthy diet, in terms of fresh fruit and vegetables and cooking from scratch but included more unhealthy foods such as crisps, chocolate, ready meals and takeaways. A systematic review, published in the American Journal of Clinical Nutrition suggests that high intakes of fruit, vegetables, fish and wholegrains are associated with a reduced risk of depression. It is no coincidence that the rise in mental health problems in the last 50 years also accompanies a rise in the consumption of processed foods and less fresh fruits and vegetables. The role of nutrition in depression cannot be overlooked. Alongside medical intervention, professional treatment and guidance, a varied and healthy diet will go a long way to help recovery, control mood and restore balance. Here’s how to focus on the role of nutrition in depression…. In the first instance, the feel good neurotransmitters, Serotonin and Dopamine are both made up of amino acids, in other words, proteins. Whilst the body can make some amino acids, there are a certain group of amino acids that are referred to as “essential”, which means that these amino acids must be consumed and come from the food we eat. If the diet is lacking in these specific amino acids, then the production of these neurotransmitters will be compromised. Ensure adequate protein intake from meat, chicken, fish, quinoa, eggs, tofu, milk, cheese, beans and pulses. The chemical processes that take place in the body often require co-factors and B vitamins play a key role in the conversion of these amino acids into neurotransmitters. If you are not eating enough B vitamins (or amino acids) you will not produce adequate levels of Serotonin and Dopamine. B vitamins are best taken as a complex and as such foods that are rich in B vits tend to provide a good spectrum. These include wholegrains, spinach, kidney beans, chickpeas, lentils, quinoa, salmon, tofu, eggs and pecans. It is also important to bear in mind that digestive health is just as crucial and if your gut is not in optimal health, digestion and absorption of nutrients will not be as efficient. Around 95% of Serotonin is produced in the gut and your gut flora plays an essential role in ensuring a healthy digestive tract. Ensure plenty of fibre to promote the “good” bacteria, so that they can thrive and proliferate in your gut and reduce the sugars, which will feed the unhealthy “bad” bacteria and increase inflammation. Fermented foods like kimchi, miso, sauerkraut and pickles will provide the good bacteria and will help to contribute to a healthy digestive system but you may like to consider a good quality probiotic to “re-innoculate” your gut at the outset, whilst you make changes to your diet. As well as improving digestive health, avoiding refined sugars will also contribute to a better mood. These sugars are quickly absorbed into the blood, providing a surge of energy. However, this will soon be followed by an energy dip, as insulin is quickly released to remove the sugars from your blood. This dip will leave you feeling tired, lethargic and jittery and can further contribute to anxiety and feeling low. Instead, opt for complex carbohydrates such as wholegrains, sweet potato and starchy vegetables like sweet potato, carrots, parsnips and butternut squash and ideally eat them with good quality protein such as fish, chicken, eggs or quinoa, to release the sugars more slowly into the bloodstream. Studies indicate that people with depression show evidence of inflammation but the cause is unclear. However, a recent 2015 study published in the Journal of Psychiatric Research established that obesity may be a contributing factor to the inflammatory profile of depressed patients. Reducing weight to a healthy level is important to help reduce the risk of developing depression as well as many other negative health outcomes. So, try making these changes, opting for a healthier diet, choosing plenty of vegetables, good quality protein and good fats and see how you feel?